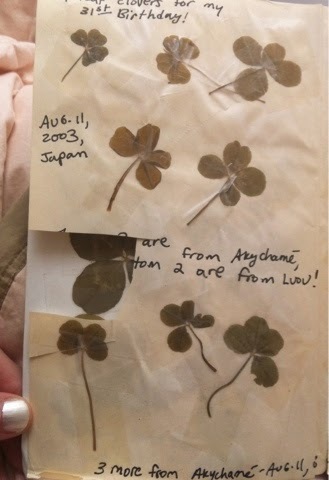 It all started in Japan when my kiddos were six and four; the earth was embroidered with luck, a veritable harvest of it. 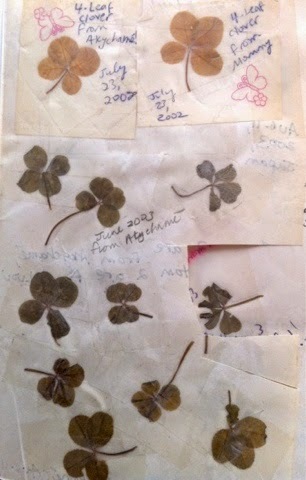 We plucked all we could find, the four-leaf clovers barely missed amongst such abundance. I was afraid the frail symbols would tear, or wilt, pin-wheeled between summer fingers. 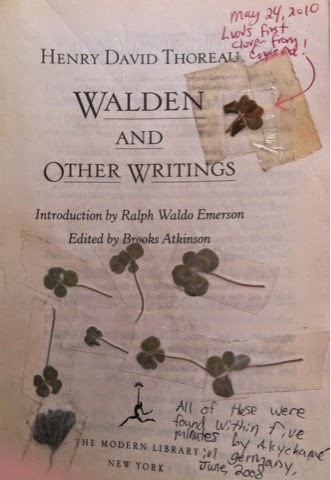 I taped it into what I had on hand–Thoreau’s Walden. His pages became a protective fence around our luck and he became a co-conspirator in its cultivation. I have frequently seen a poet withdraw, having enjoyed the most valuable part of a farm, while the crusty farmer supposed that he had got a few wild apples only. Why, the owner does not know it for many years when a poet has put his farm in rime, the most admirable kind of invisible fence. It’s true, I’ve often taken possession of a thing of beauty with words alone, weaving it into my cosmology with a turn of phrase. Sartre, in The Words, said that to name something is to own it. 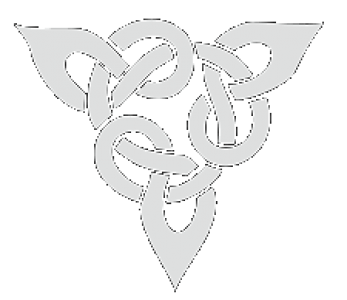 ‘Riming’ is a way of naming and owning the things we can never really keep. I own whole galaxies, kisses, my children’s childhood, a reconstructed version of my own childhood. I also own things that have never existed. I walk into the farmland of imagination and convince myself that it’s all mine; wild apples, stolen words. Building a poem around a thing–the most admirable invisible fence–is indeed a way to corral it in our affections forever. Thoreau has fenced our green tufts of lucky earth for us from Japan to Germany to England, and now I’m fencing it again, in this journal entry. Soon, perhaps, a more thoughtful essay will come of it. The irony of poetry is, the more I fence it, the more accessible it becomes to others. In this sense a fence is a frame; a showcase. 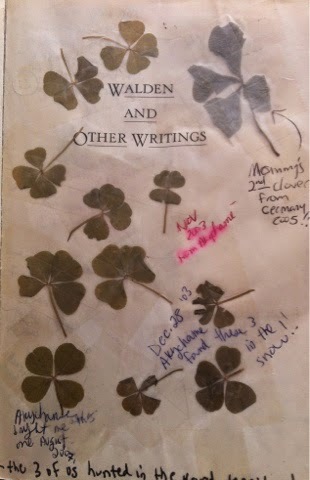 These green quatrefoils immortalize not only the earth, warm days, and our deceased dog splashing in the lake, but also the laughter, exuberance, the foreverness as we three distinguished clover from grass with fierce gaze, backs bent, page after page of Walden still waiting for our transplants. 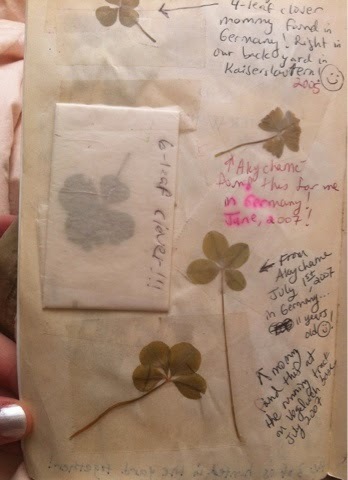 I run my fingers over the tape and read my old writing. 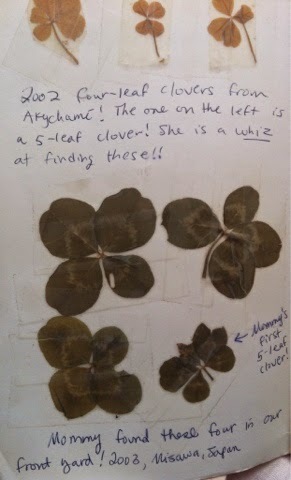 I harvest the clover again and again, a perennial that grows each time I open the cover.